Brugmansia suaveolens pink is a semi-woody shrub or small tree that gets 6-15 feet tall, usually with a many-branched single trunk. This Angel Trumpet occurs naturally in South-est Brazil. It is widely grown as an ornamental everywhere. It is a fast growing plant. Brugmansia may be grown in containers or in the garden. The overall plant has a coarse texture but the flowers are remarkably beautiful. They are exceptionally fragrant, about 12 inches long and shaped like trumpets. The corolla has five points that are slightly recurved. The flowers are usually white but may be yellowish; they are pendulous, hanging almost straight down. The large trumpet flowers bloom for most of the year. Container-grown plants moved indoors for the Winter may bloom during those months. The leaves are generally oval in shape, green, up to 10 inches long and 6 inches wide, and even larger when grown in the shade. It bears showy fruit, 4-6 inches long, somewhat rugose. 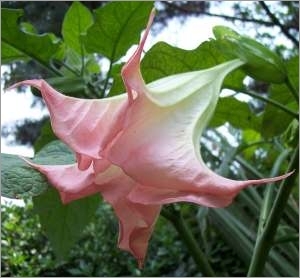 Brugmansia are toxic, all parts of plant are poisonous if ingested.